The value of pawned items at the Monti di Pietà at the end of January 2016 stood at €311,425, the highest for the last 10 years. Finance Minister Edward Scicluna gave this information in an answer to a parliamentary question put by Carmelo Mifsud Bonnici (PN). 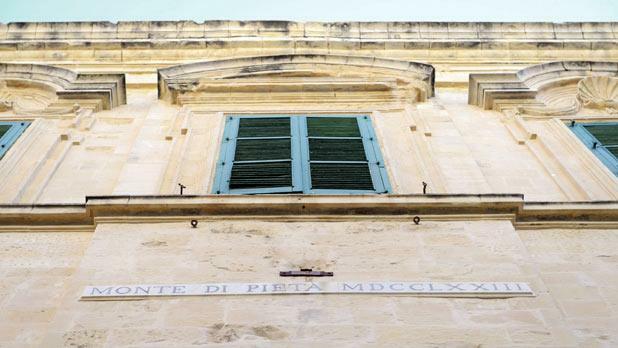 A total of 3,183 gold items are currently pawned at this institution, the longest outstanding of which was pawned 35 years ago in 1981, Prof. Scicluna said. Similar institutions originated in 15th-century Italy and were developed in cities against usury and for lending as a form of charity. They were organised and operated by the Catholic Church to provide financial loans at moderate interest to those in need. The Monti di Pietà depended on raising a monte, a collection of funds from voluntary donations by financially privileged people with no intention of recovering their money. Needy people would pawn an item of value in exchange for a monetary loan. The Maltese Monti di Pietà was established in 1598 during the reign of the Knights of St John at Merchants Street, Valletta. In this type of service, gold and silver artefacts and precious jewellery are accepted as security against loans with a five per cent interest rate, payable within three years. Last October, following a question by Godfrey Farrugia (PL), Prof. Scicluna informed Parliament that the €158,012 value of pawned items in 2010 had plummeted to €94,333 the following year, reaching a nadir of €23,357 in 2014. The 2014 amount was almost a nine-fold decrease from 2008, when €202,266 worth of precious items were exchanged for cash. One possible reason leading to the decline in the Monti’s activities may have been the rapid rise in the price of gold after 2010 as the flat rates established by the government were no longer deemed competitive compared to the price per gram offered by commercial gold vendors. At law, anyone 18 and over can deposit precious items at the Monti di Pietà in exchange for up to €600 per day.